At Republic Services, we are dedicated to supporting our customers and being a good neighbor in the communities in which we live and work. Each year in coordination with the Town of Fountain Hills, Arizona, Republic Services awards a $10,000 grant to a deserving Fountain Hills non-profit organization. Local Fountain Hills organizations interested in being considered for the grant may submit an application with a business plan for the grant monies. Together with the Town of Fountain Hills, Republic reviews each application thoroughly and then shares between 3-5 of those finalists with Fountain Hills residents for their final vote. The local residents vote on the charity by utilizing recycle points they have accumulate throughout the year by registering each time they utilize Republic’s recycle curb side services. 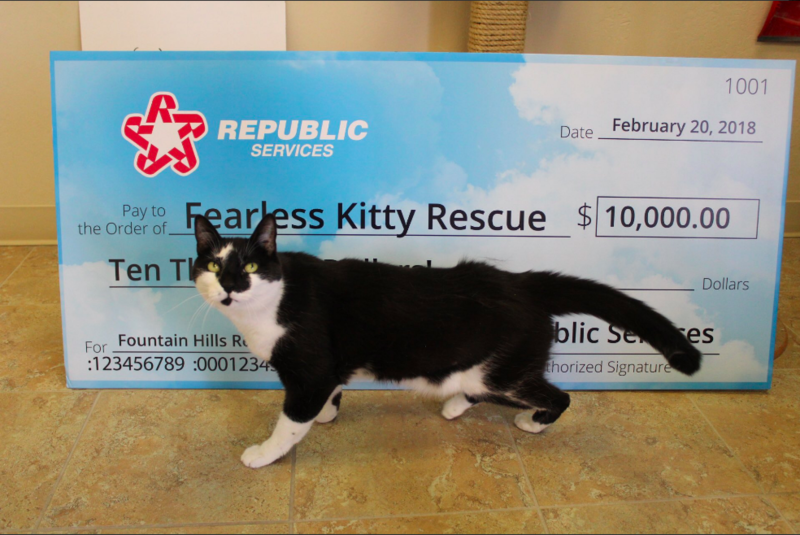 The Town of Fountain Hills and Republic Services are pleased to announce the winner of the most recent Community Grant for Fountain Hills is Fearless Kitty Rescue. Fearless Kitty won with a total of 459,514 votes, followed closely by River of Time Museum and Thunderbird Artists. Fearless Kitty Rescue is a recognized 501(c)(3) non-profit, no-kill rescue committed to finding homes for homeless and abandoned cats of all ages. The organization is funded one hundred percent by donations and is staffed by enthusiastic volunteers. For more information about the organization or to volunteer, please visit www.fearlesskittyrescue.org.